The Cartoon Cave: Happy Birthday, Dave Smith! Wow I had no idea that you did that caricature of Dave, Pete! That's awesome! Yes it's been used for years in various Disney publications and online now at D23.com for the Ask Dave column. I was at Dave's retirement party drawing character sketches this past Friday and while I didn't see the painting, there was a sculpted version of Dave with the Donald doll. I'd be interested to know how many of those were made. Sweet, Pete! 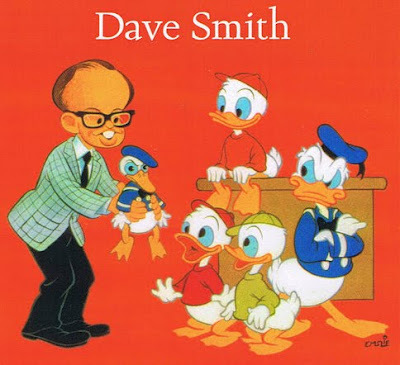 Dave Smith sounds like a swell guy who really cares about classic Disney animation. Great caricature as well. "the Animation Building, which was then still the REAL Animation Building before it got booted off the main lot." Why was it booted off the main lot in the first place anyway? Just reading that makes me feel very sad. Roberto: Michael Eisner, in his infinite wisdom, decided soon after taking over as CEO in 1984 that his cronies from the live action studios that were newly appointed execs now at Disney needed prestigious office space. And so those pesky animators had to be booted out to a warehouse in Glendale in order to free up what Eisner considered to be prime real estate on the Disney lot. Though many years later Eisner decided to bring the animation crew back to the main studio by constructing the Sorcerer's Hat building across the street, it was too little too late - things would never be the same as they once were back in Disney's Golden Age, when the animation department occupied the Animation Building that Walt had custom built specifically for their needs. The caricature of Dave is just awesome and touching. Happy birthday to him. First met this real gentleman in 1974; we even played miniature golf somewhere in L.A.! I remember meeting you way back then when you worked in the Sun Bank building with Russell and Don "Ducky" Williams ... in 1990. You were listening to kd Lang too! Do they light the corners of my mind? Oh, the story about the moving of the Animation staff to Gendale is detailed in the faboo film "Waking Sleeping Beauty" btw! I had the pleasure of meeting Dave while working for WED years ago. He was very helpful in my quest for CINDERELLA and other Disney animation trivia. He took preserving Disney materials very seriously! Hopefully, "Waking Sleeping Beauty" will make it to DVD so more of us can see it!